Except for adding the Cornfather to the mix for dramatic purposes, today’s comic was ripped straight from my life. My dad has built so many things out of wood, aluminum and PVC that I just assumed he would do something awesome with my travel toothbrush holder. Sometimes the simplest solution is the hardest to see, I suppose. So, any stories about other creative parents out there? i think wordpress needs to redesign the “pukey” emoticon. it conveys more of a “silly ha!” then a “pukey blargh!” dontcha think? Agreed- they should have Xs for eyes, and green cheeks. Works every time. You should never leave your tooth brush in care of other people, learn from my mistakes. School trip few years back, my best friend got pranking fever. He glued head of my brush right after we arrived at our hotel and it solidified during the day. I didnt know about it and didnt realy paid attention in my alcohol-happy state when I was going to use it before bed. Lets just say that it was probably firts time someone knocked out his own tooth with his own tooth brush… I still dont know why I was going to brush my teeth in state where I couldnt even tell that its not normal for it to be so stiff or what is appropriate strenght with which to use the brush. that’s horrible, Maryz! i guess it could’ve been worse – your friend could’ve put glue on your q-tips or swapped your eye drops with super glue. also, i’m afraid to ask how old you were when this happened. You know, despite the trauma it caused, I think this prank is better then some of its alternatives. You ever brush your teeth with hot sauce? The suffering takes days to end. Some of you are probably thinking, “Oh, hot sauce is red I’ll see it on my toothbrush.” Wrong. Hot sauces are colored red for sale. The true form of spicy juices, known as Capsaicin, is colorless, odorless, and available for easy purchase. I didn’t see it or smell it on my toothbrush, but I sure as hell felt it turn my gums into molten lava. great. as if i didn’t have enough to worry about with terrorists and swine flu, now i gotta worry about my toothpaste being sabotaged with hot sauce. we live in a dangerous, scary world, Foxmouse. Thanks Foxmouse, I’m totally doing this to my little brother! “cruella” wouldn’t happen to be short for “Xinda” now, would it? I like your dad already, with the realistic expectations and actual solution both. I can just see him matter-of-factly tuning up his own car, then turning around and helping you put a remote-deploying parachute on your pinewood derby car. My dad? For inventions was mostly known around our house for awesome stories. I mean the kind that almost BEGGED sleeping bags and a campfire awesome. For building things, though, he could do some wicked stuff with the random condiments and mystery meats in the fridge whenever mom wasn’t cooking. The dishes were tasty, but somehow ended up tasting the same…like a mixture of hamburger helper, taco, and a really, really thin (but meaty!) gumbo. Even he was never sure what to call the end results, so every single one was “Refrigerator Surprise”. Your whole family sounds awesome (Bro-in-law too)! I think we’re both pretty lucky, the way you tell it. Popbot is so cute! For a problem like a toothbrush being too long, I think popbot has the right idea. Sometimes you need an outside perspective to realize how small your problems truly are. Thanks, popbot, for putting my own life into perspective. 🙂 Sometimes you just gotta cut off the end of the toothbrush and move on. someone should put your last sentence on a t-shirt, Annie. it could be as popular as the “hang in there” kitty posters. or not. Thats one way to fix that. i love the fact that Popbot chose the simpliest solution. Is it just me or is this the first ever appearance of your dad? If so give him my congratulations on joining the cast. My predecesor is pretty handy but he tends to work on things he needs to do, not much time for anything else, realy… At the moment, what counts as something that needs to be done is new holiday cottage. Popbot’s been in the strip a few times, Maryz, but i think it’s been almost a year since last we saw him in this strip from last january. but his most famous appearance has got to be his trip to the “surplus store” with jefbot, as seen here. “holiday cottage”? can i visit? You have time to visit Europe? Its almost finished, by the way, we plan to celebrate new Year there with a bunch of my friends, if all goes well, so you are welcome to come. sorry to hear he passed away. sounds like he was an amazing dad! Aww! Popbot rocks! Cf might not be too happy about it, but hey.. it works, right?!? 😛 I’d love to see pics of things Popbot has made over the years! Maybe feature them in the blogs that go along with the strips, which would be epic. Hmm.. nothing my parents did, but I make Christmas ornaments out of old blown light bulbs. Something else to add to my list of stuff I have to share with you then? 😛 This was a cute strip! some of the cooler stuff – like the chicken coop he made out of a trailer – is now gone, but i’ll see what i can dig up next time i’m over at my parents’ place, Spanky. totally jealous about your snowfall. the past few times i’ve been to the east coast over the past year or two, i’ve always gotten there either right before or right after, but never during. pbbt. very happy you found it funny, Mombot. i’m never 100% sure how these strips are going to come across, really. heheh. can’t wait to hear what dad thought of it! Go Schuetzes! Even though I envy you! Great strip. You gotta love someone who can think outside the box to see the best solution. My mom is the one who can do anything. She is like Martha Stewart only without the jail time. My dad can Jury Rig just about anything. It may not look so pretty but it does it’s job and that’s what counts. same here, DJ – there’ve been a few questionable aesthetic choices my dad’s made, but generally, his creations get the job done. I’d use a paper towel roll wrapped in duct tape. Horrible idea? Yes, for various reasons. That is all. i like it! my “travel toothbrush holder” is now a ziploc, D. probably due, at least in part, to this incident. haha. that final panel made me LOL on myself. i am now demanding a mombot/popbot tshirt. DEEEMANDING IT. Parents themed t-shirt is a good idea. Count me as vote for. Make it so, number Jefbot. ENGAGE, Skipperdee! i’d wear that, too! i thought we were kinda joking about all this but it does seem like many of you are actually interested in a Mombot shirt. interesting. your demands have been heard, skinny. maybe i’ll make it if others demand mombot/popbot swag, too! Oh, *HECK* yeah! 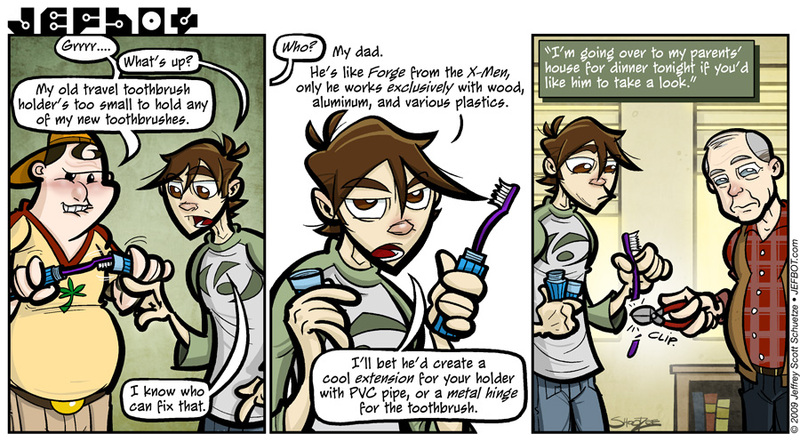 The third panel (minus text box) with Annie’s “Sometimes you just gotta cut off the end of the toothbrush and move on.” quote on a T-shirt. I’d wear that! This is my mother, in a nutshell. She has a solution for everything, even if it doesn’t need a solution. She’s made fireplaces, wreaths every year, doll houses from scratch… she’s more of the “domestic” version of Popbot, I guess you could say! She also comes close to slicing off digits every few days… oh, the price of eccentricity! yikes! gotta watch those digits! my dad pretty much has new cuts and scrapes on his head and hands every time i see him, Kate. tell your mom to be more careful! thanks, man. i’ll be seeing my parents this weekend, so let me know if you need anything else fixed. That’s so funny… sometimes the easiest thing to do is right in front of our eyes… we just need someone wise to show us it’s okay to be creative! Awesome! it’s true, Funnyshaffer. althought the “easiest” thing to do isn’t always the prettiest. Sounds like my dad. He used to build/fix all kinds of things when I was a kid. Then he would give me the scraps from his project and let me make things. When I was about 5 I made my sister a “skateboard”. I also painted our Chocolate Lab blue because she got in my way when I was working. Dad’s had to give up all the woodworking stuff he used to do, his hands shake too much nowadays. ha! how’d that skateboard work out, Anonymouse? did your sister survive it? 😉 and how did your parents react to the blue dog? yeah, my dad used to give me scraps to play with, too. i made a horrific looking chair once. it wasn’t much to sit in, but made a great little stepping stool. My father was more into “recycling” then making his own things. He came from a modest home so he would see a lot of potential in used things. He would take stuff to the Salvation Army only to come home with “new” stuff that just “needed fixing.” He’d repair office supplies like chairs, desks, and bookshelves, patch hats, coats, and jackets, even convert pots and pans into planters. My father would do a lot of things for my sister and I when we were to small to care, but as we got older he kinda figured it wasn’t “cool” to give his daughters things from the Salvation Army so he only repaired things for himself. that’s hilarious about your dad taking stuff to the SA, only to come back with more things! heheh. i love that he’s into ecology, too. and i agree about finding good stuff at the goodwill or salvation army – i’ve had a bookbag i picked up at one of those places like, 10 years ago, and it’s still good. problem is, i don’t have a decent GW or SA near me anymore. most of the ones i grew up with have disappeared for some reason. Although…in real life I think the toothbrush modification may have involved a tape measure, a level, a compass, a protractor, the pythagorean theorem, a vise, a table saw, and a couple of guys on a grassy knoll…or at least it did in my mind. Call me a conspiracy theorist, but it’s hard for me to believe that Popbot would leave such an important, exact operation as this to the simple snip of a pair of scissors or pliers…I mean we’re talking important dental health here. Just like it’s hard to believe in the lone gunman, it’s hard to believe that a modified toothbrush could fit a toothbrush holder so perfectly without some help (human? alien?). Through the years, the toothbrush operation has become so shrouded in controversy, mystery, secrecy, etc., I fear the actual method of Popbot’s modification may never be known. Gotta go though, I think I see Bigfoot in the hills outside my office. too bad the tv shows In Search Of… and Unsolved Mysteries are no longer around. this matter would be the perfect subject for those programs to explore. LOL! My dad constantly makes me shameful of my own lack of ingenuity or practical knowledge. Last week, my uncle was over and we had some contractors over to put insulation in our crawlspace. When we opened up the access, there was a pool of standing water in the crawl. I freaked out and immediately called the plumber. When my uncle got out of the shower and looked at it, he simply jiggled the cord to our sump pump and loosened up the float, and there went all the water. funny story, Stan! i wouldn’t have been much use in that situation, either. heheh. this reminds me of the old story about NASA developing a pen that works in space. Spent millions on the technology. The Russian solution was faster and cheaper… they used a pencil. me too, Shay. me too. He was! 🙂 The hearse/camper was built before I was born (late ’50s, IIRC) so it’s probably gone to that Great Campground In The Sky. when all else fails, talk to your old folks. I played Donut delivery man today and saw your pops…. come to think of it, he looked at me kinda strange . . . .
hey, Beastie! yep, i heard you dropped by there. Mombot said she’s sorry she missed you. now when are you gonna drop donuts off by my place??? That’s totally something I’d expect your dad to do. xD Haha this one is great. Hey Jeffbot! I <3 yer comic! my daddy made me this amazing metal maze that if you touched the metal it would electrocute you. It really hurt! you’re either one of my sisters (probably whose name starts with an “X”) or you’ve been looking at my notes for tomorrow’s strip (JEFBOT.196)! plagerism!!! you stole my life for your Tuesday, 12/8/09 Strip! my lawyers will be calling you!!!!! Dadbot it’s the best! Practical to the very end *LOL* Why the heck didn’t Michael or Jef thought of that, huh?